In The Bronx, A Theater Performance On A Bus All the world's a stage, and the folks at the Foundry Theatre want to drive people around it. 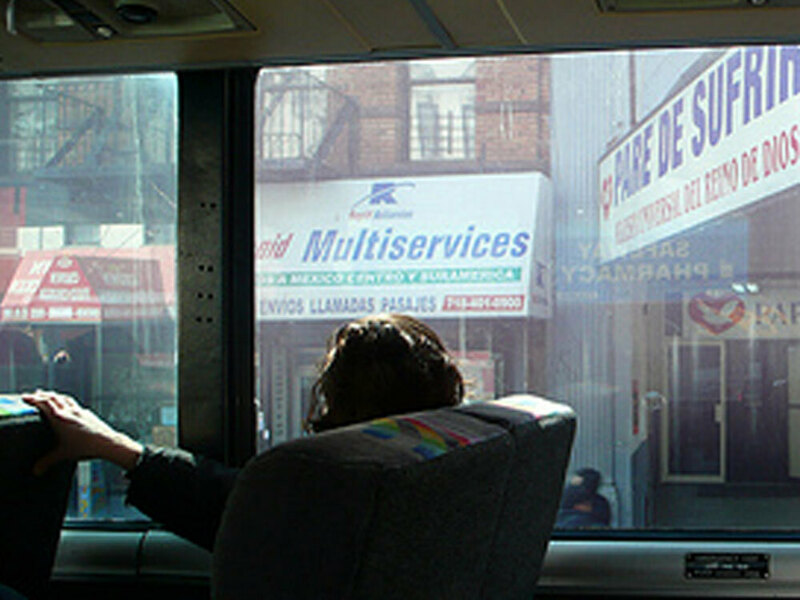 Their newest theater piece takes place on a charter bus winding its way through the South Bronx. The performance is part tour, part narrative, but the star is the Bronx itself. During one of the Foundry Theatre's three workshops for Provenance of Beauty, production manager Dave Ogle gazes out to the sites described in the script. All the world's a stage, and the folks at New York City's Foundry Theatre want to drive people around it. Their newest performance piece, Provenance of Beauty, takes place on a charter bus winding its way through the South Bronx. Part tour, part narrative, the show begins when the charter bus drives over the Willis Avenue Bridge into the Bronx. As we watch the traffic and construction, recorded voices come into our headsets: "Listen. Let's say this is the type of tour where we travel from place to place entering what is." As the bus trundles along, the outside scene changes. Different actors, both live and recorded, speak in the voice of the Bronx. We see auto repair shops and a prison barge. The bus pauses to let the audience gaze at a graffiti-covered wall, listening to the neighborhood's objections to the art: "They wanted palm trees and flowers. ... They didn't want to see their struggles on these walls. They lived their struggles every day." On this particular day, Claudia Rankine, the author of the piece, is riding along in a window seat. Rankine is a poet who spent her childhood in the Bronx. She cobbled the piece and the route together through interviews with business owners, housewives and artists. "We drove the route again and again, and each time more and more things became the focus of our attention," Rankine says. Since each scene has to be synced up with the music and actors, traffic can become a factor in the performance. "Part of the dramaturgy becomes navigating traffic, and length of a light, and whether it's a Yankee game day," says Melanie Joseph, artistic director of the Foundry Theatre company. "You have to adjust your expectations and the sense of timing around the reality of the landscape, which is interesting." The landscape changes with each performance. At one stop, a guy yells at us that we can't stop the bus here. On another street, a bunch of kids playing in a hydrant spray the bus windows and upstage the performers. A double-parked car sends us off script and onto another street. There's not much plot in the performance, so the drama becomes more about if we'll actually make it back to where we started. It's a strange experience; the play is about the South Bronx, but we never get off the bus, never get to interact with the scenes we see. Much of the talk is about the issues of gentrification, but what could be more gentrifying than a brainy theater piece in a tour bus? The tour ran 15 minutes longer than planned because of the extra traffic, and it seems that the real star of this performance is the driver, Mary Wallace. The bus goes out twice an afternoon on weekends, and every time, Wallace encounters some new obstacle: traffic, stopped vehicles, people who decide to cross the street despite the big bus. "But other than that," she says, "I keep moving." For more, check our their website.